Luckily this month we also have the Menstuff hunt so the guys can dress up nicely for that big day. I made sure to pick up all of the gifts as soon as I could because I just love unpacking and being surprised by all of the items the creators have hidden for us to find! House of Ruby created this really lovely shirt and boxers! It’s just right to set the mood and to surprise your partner(s) with as you serve them breakfast on that special day. It comes in appliers for Slink and Omega. No.Match also surprised us with a groupgift this month, hair for both ladies and the gentleman! It’s a fatpack with all hair colors and also a hud to pick a color for the headband. The days are slowly getting longer and we are on our way to spring. Thankfully, because I could really use some warm weather and a good dose of sunlight. I’ve been missing out on a lot, forgive me for this. 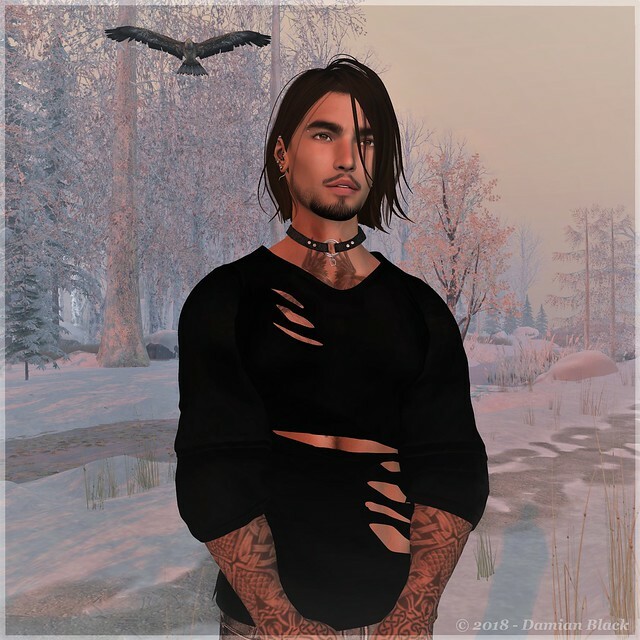 Today I found that the Gothic Garage Sale hunt was still on until the 3rd of February, so I made sure to pick up some fun items to dress up in. Every hunt prize is for only 5L and there is a lot of shopping to do at the event itself! Not only did I find this really pretty sim called A New York Christmas, but I also found the biggest event with gifts I have ever seen. A nice thing about Christmas are all the presents that given away in SL. What was even more special was that the Men Cave event has a very creative looking Christmas tree with gifts underneath it for the guys. That’s how I found myself this fun Christmas sweater by FashionNatic. Even though the sweater makes me blend in more with the Christmas crowd, I was thankful to find a free mustache with goatee which allowed me to get some heavy metal looks and some glasses to make me look smarter than I actually am. I’m wondering if we will get snow here this winter. Thankfully there are some really beautiful sims on SL to visit in case I will miss out on it again. And the upside is that I don’t have to wear a warm coat and I can wear shirts that have holes in them. The hair is a free group gift from Barber Yumyum. I know that it is probably supposed to be female hair, but I do like longer hair as well and I thought it was not that bad looking at all. It only comes in one color (blond), but since you can edit the hair, you can tint it to however you like it, which is what I did for the picture. The shirt from Sweet Intoxication actually available for free in two colors. The black version I’m showing now is easy to find, it’s with the group gifts. If you would like a red version you will have a little hunting to do. You will be looking for a blue scroll for the Naughty or Nice 4 hunt. The Womenstuff hunt ends on the 30st of November, so this will be you last chance to pick up the free- and dollarbies. The heels are also a Womenstuff hunt gift that can be found at DE. Boutique. That is… if you will be able to find the hidden hunt item that is in the form of a little T-shirt. For those that will not be able to make it on time before that hunt ends, worry not, there will be PLENTY more hunts and events when December begins. One of the events that has already started, is the SaNaRae event and they also have some free gifts out. I picked up this nice choker from Supernatural that I wanted to show. It comes with two huds to choose a color for the bow and tons of colors for the gem. I also found these really nice ripped leggings from Rekt that also includes a hud with 7 colors to pick from. It didn’t say what size it was, but I assume it’s just Maitreya since it fit my avatar’s body perfectly. This is not something we celebrate over where I live, but I actually think we should. It’s kind of nice to take a moment and think about what we are thankful for at times. Even though it’s getting colder outside, at times when the sun comes through it’s nice to take a moment and feel the warmth of it on your skin. I’m pretty sure I should have worn a shirt underneath my jacket, but I didn’t think about it until now. No wonder I’ve been cold all day. The outfit I’m wearing is a free subscriber gift from Mangula. You can get the gift by clicking the sign on the wall that says subscribe (this won’t take any group space and you can unsubscribe whenever you want to) and when you are done you can click the gifts on the ground. For this male gift you will get a jacket, pants and braga in various colors, sized for Gianni and Jake. The necklace is a free gift from RealEvil for the SLF&O group. I’m uncertain if it has a meaning to it, but for some reason I really like it a lot. It comes in a male and a female version. The leaves are falling and the forests are still very colorful, but soon the branches will be bare and the cold will come over the land. I think that every season has something special, something almost magical. Sure, the wind and the cold in the winter and are not always fun, but once the first snow begins to fall it always makes me smile. It’s always inviting to go out for a walk, then come home and to wrap yourself in a warm blanket with some hot tea and chocolate. 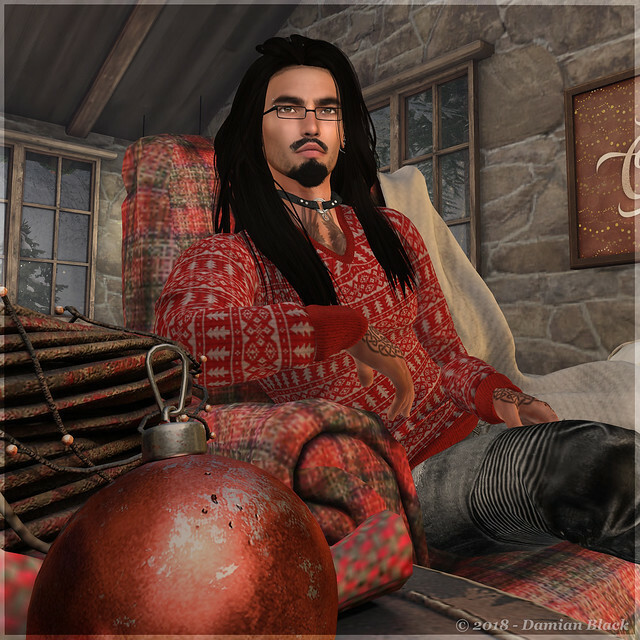 We do need to keep ourselves warm when outside and for some reason I like to prepare for winter in SL as well. Thankfully the Womenstuff hunt has plenty of warm gifts, in case you haven’t already warmed up by watching your avatar run around in order to find all the hunt items. Firstly I would like to point out that the hair on my avatar is completely free. It is available at Sintiklia and there is no group you need to join. I like it a lot and it’s a bonus that it’s also a fatpack with all colors you can think of and with more of less volume. So very generous of the creator! New month, new gifts. I hope you all had a nice Halloween evening. I enjoyed looking at the pumpkin I carved and was happy that I was able to eat all of the candy by myself. I’m a member of the Mina hair group and they were so kind to bring out an exclusive Halloween gift last minute. Since I also found this nice free dress that Mistique has hidden as a gift for the Womenstuff hunt (which started today), I decided to take a picture of a grumpy demon lady, who is not amused that she woke up with blood in her hair after hunting down innocents all night. She’s probably very hangry too.